A few year back, when many noise rockers & longtime punks began discovering fey English folk of the 60s and 70s, and wore their new-found allegiance on their sleeves -- like it was just a natural progression toward songs of leaves & trestles & the changing of the seasons -- I made a secret pact with myself that I would never, never, never fall for the genre, lest I eventually get caught up searching the stacks for PENTANGLE bootlegs and whatnot. Fey folk was my mom's genre, and I was content to let her keep it. Well, it looks like Mom's getting a nice CD-R of the VASHTI BUNYAN "Just Another Diamond Day" reissue for her birthday this year, because I can't fall on my sword in the face of music this great. 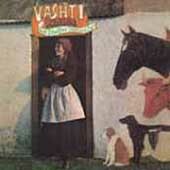 Vashti Bunyan was one of thousands of British hippies who lit out for the country to start communes, commune with nature and all that. During 1968-69, she wrote the shy, distant songs that would make up this, her one and only album. In 1970, "Just Another Diamond Day" was recorded and released, with help from a couple of her folkie pals in the INCREDIBLE STRING BAND and FAIRPORT CONVENTION, all the while managed by Stones honcho Andrew Loog Oldham. Bunyan disappeared to the Scottish countryside after a grand bit of initial next-big-thing hype quickly dissipated, and went on with a relatively normal life of childrearing, shepherding and such. This record entered the realm of forgotten landmark, and there it stayed until a few years ago when several publications gave it some renewed life & helped get it reissued on CD. If NICK DRAKE is now a UK folk legend thanks to Volkswagen, then Vashti Bunyan -- whose music is easily as otherworldly and great -- should have a proper place in the pantheon posthaste. Starting with track #2, "Glow Worms", which is just about perfect -- her "Pink Moon", if you will. I know this CD's garnered a ton of attention the past few years, enough so that I broke my vows and checked it out. Her understated, miniaturist arrangements and exceptionally gentle touch contribute to a real ghostly and tranquil feel, one that fits in perfectly with her back story (hippy girl renounces society, moves to a quiet green place with no running water). There's nothing cloying or forced about this rustic beauty at all -- in fact, she's not even as one-dimensional as I make her out to be, given almost comic tracks like "Timothy Grub" and "Jog Along Bess", in which Bunyan whimsically recounts some of the more colorful characters of her gypsy-like past, including her cows. The guitars on this record are tuned to sound nearly like banjos, and at times carry strange tones that sound like something apart from conventional 60s folk music as we know it. No doubt that my favorite modern folk group VETIVER copped some moves here. There's also a big, brassy, full band closer on the CD that's one of several extras, a Stones cover (!) called "Somethings Just Stick In Your Mind". This 1965 7" of hers sticks out not like a sore thumb (it's a stellar pop song), but like a transparent attempt to make young Vashti into the next MARIANNE FAITHFULL, whom Oldham had some experience crafting into a star. If you're expecting a by-the-numbers Judy Collins thing, I assure you, you won't find it here. This is some fine, early morning, watching-the-dew folk music with lovely, all-knowing vocals. If you're up for that sort of tender vibe from time to time, punker, then hey, have I got a record for you.